We are so proud to welcome our new associate dentist joining Dr. Noah at Region Dental! 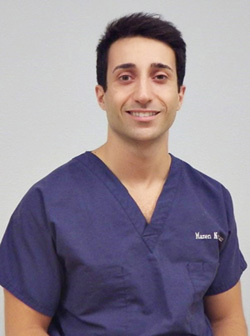 Dr. Mazen Naaman, a recent graduate from the University of Oklahoma College of Dentistry, is a native of Tulsa, Oklahoma. He loves the Tulsa area because of the friendly people and environment this wonderful city has to offer. Dr. Naaman knew he wanted to be a dentist from the time he was a child visiting his own dentist for regular cleanings. He would always think, “Someday I will be a dentist too!” He graduated from the University of Oklahoma with his undergraduate degree in microbiology, and then went on to the University of Oklahoma College of Dentistry. The most satisfying part of being a dentist for Dr. Naaaman is the interaction and personal connection he has with his patients while being able to help them achieve a beautiful, healthy smile. In his free time, Dr. Naaman enjoys drawing portraits and painting landscape pictures. He also loves to travel and visit different countries each trip.